Efficiency up to 11.7 percent, as are other metrics. Sales down slightly. Gross margin down 2.9 percent to 45.8 percent. 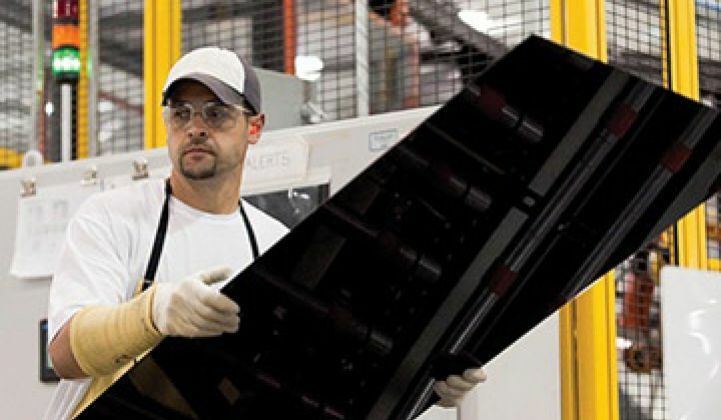 First Solar (Nasdaq: FSLR), the largest solar company in the world by market capitalization, just announced its financial results for the first quarter of 2011. Net sales were $567 million in the quarter (Street at about $555 million), a decrease of $42.5 million from the fourth quarter of 2010. Quarterly net sales decreased slightly from $568 million in the first quarter of 2010, primarily due to lower ASPs. First Solar's margins fell amidst falling ASPs, a rarity for the firm. Shares fell 2.1 percent to $134.66 in late trading. “Despite European market uncertainties, First Solar has good visibility into our demand for 2011,” said Rob Gillette, the CEO of First Solar. The firm's margins remain strong and could stay solid even with PPA pricing at $0.10 per kilowatt-hour -- if the company executes on its long-term cost-reduction roadmap.